This 3BR/2.5BA home is 2 blocks from the beach and features two balconies, two covered patios, a fenced backyard, and an outdoor shower—ideal after a day on the shore. An open floor plan, tile and hardwood floors, and contemporary décor feature throughout. This large 2,140 square-foot space makes the perfect beach getaway for a group of family or friends. Walk to an array of nearby dining and entertainment spots. Adventurers can rent bikes, kayaks, paddle boards and more. And Schlitterbahn Waterpark is just a 6-minute drive. 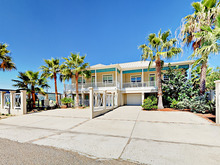 This home is just 2 blocks from the beach, making it easy to go back and forth throughout the day. Adventurers should check out SPI Activities (4-minute drive), where you can rent bikes, kayaks, paddle boards, and more. And Schlitterbahn Waterpark is just a 6-minute drive away. Walk to an array of nearby dining and entertainment spots. For a meal on the water, try Palm Street Pier. For Mexican-inspired seafood, Cap’n Roy’s is the spot. Or for something adventurous, head over to Ceviche Ceviche, where you can put together your own dish. All are less than a 6-minute walk.